Dutch elm disease, Ophiostoma novo-ulmi, is a fungus that targets certain members of the Elm (Ulmus) genus, including American elm, Scotch, and Red Elm. The fungus attacks the xylem within tree, causing an immune response. The tree reacts by plugging the xylem with gums, shutting water transport down, which in turn prevents vital nutrients from flowing as well. The leaves then wilt from lack of water, and this appears in the tree as flagging, which is the yellowing of foliage on the upper branches in the crown. Generally this is seen in late May or early June. The disease quickly moves through the rest of the tree, often killing even a large mature tree in less than a year. The fungus is primarily transmitted in two ways. The first is by bark beetles, either the native Elm Bark Beetle, Hylurgopinus rufipes and the European Elm Bark Beetle Colytus multistriatus . Both insects over winter as adults under bark of unhealthy infected elms, and emerge in the spring covered by fungal spores of DED. The adults feed on tender bark and twigs of healthy trees, spreading the fungus, and then lay eggs in weak and dying bark of elms, starting the cycle again. Insecticides to slow the progress of the beetle are minimally effective against the native beetle, and not at all against the European beetle, so sanitation (removal of dead wood) is the recommended course of action. The second method of DED transmission is root grafting. American Elm trees within 50-60’ or closer to each other can graft their roots together, effectively linking the trees. The fungal spores are carried in water throughout the xylem, and the shared roots can quickly infect an otherwise healthy tree. While a beetle sourced infection may take a year or two to kill the host tree, root grafting can spread the disease and cause mortality in a couple of months. Root grafting has turned out to be the major cause of DED transmission in cities, as street after street lost elms like dominos falling. 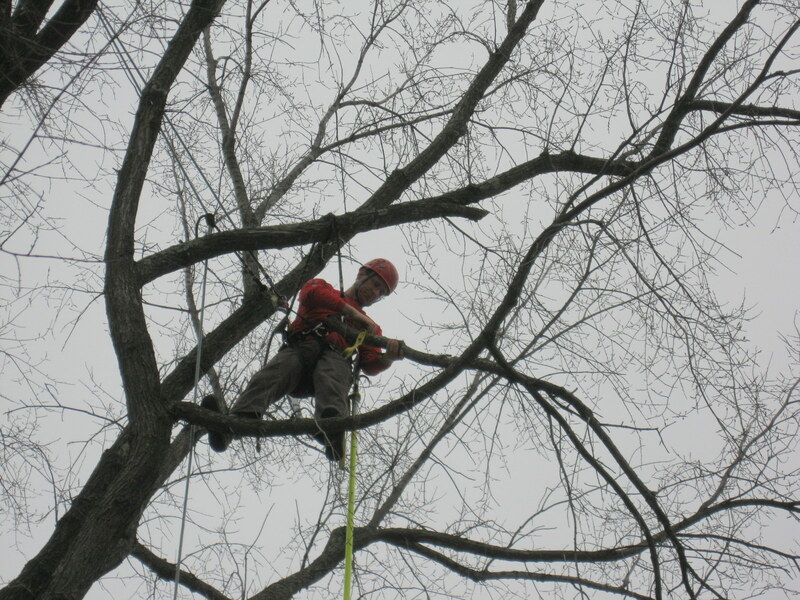 Middlebury College uses a multi-step approach to saving the American Elm on campus. The first trick is to maintain vigor in the older trees. This is done by prescriptive fertilizing every year, to make sure the tree is not lacking in any macro or micro nutrients. We also apply compost from our composting operation, and mulch leaves in the drip zone of the canopy to increase organic matter. The most effective way to prevent the spread of Dutch elm has been in sanitation, removing any dead and dying elm trees. Several larger urban areas have had good luck with this method. By removing diseased wood, the source of the infection, as well as the overwintering sites of the bark beetles, the source of infection is greatly reduced. A single piece of elm wood firewood sized can produce over 1800 bark beetles. Middlebury prunes the heritage elms of any dead wood 1” or larger (sizes that can support the bark beetle).The pruning work is done in the winter, as the cut end of the branch is attractive to the elm bark beetles during the growing season, and could spread the disease. The major problem we have with sanitation on campus is that American elm is spread throughout the Champlain Valley as a native tree, and, as it generally doesn’t succumb to DED until about 30-40 years old (after reproducing age), will always be around, albeit as small trees. We can’t remove all the elm surrounding campus, like in the woods of Ridgeline, say, or along the edge of St. Mary’s Cemetery, so we can’t count on sanitation as being as effective like in other more urban locations. The most effective preventative we have to prevent DED is by fungicide, something to kill the spores of the disease causing fungus. There are only a couple of approved fungicides to treat trees, and we use a product called Arbotect. This kills the fungus that causes DED, and lasts up to three years. It does this by the unique ability to translocate into new sapwood, and persisting through environmental challenges. If symptoms of DED do appear, we use another fungicide called Alamo. This needs to be injected every year if used as a preventative treatment. The constant wounding of the tree to do that is worrisome. Both fungicides are applied by a process called macro-injection. 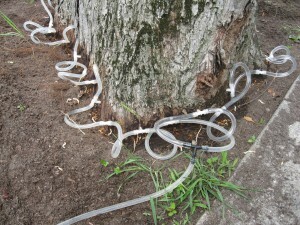 Holes are drilled into the base (root flare) of the tree, and tubes attached. The fungicide is then pumped to the base of the tree, and taken up by the tree’s natural process of transpiration. This is done in the beginning of July. The final preservation technique is replacement of the American Elm in the landscape. Many agencies are actively breeding resistant strains of Elm, and we’ve planted several varieties over the years, including ‘Accolade’ and ‘Discovery’. We also have specimens of ‘Princeton’, ‘Liberty’, and an early variety called ‘Christine Buisman’. Naturally, we plant a wide diversity of tree species, so we never run into such a historic loss of canopy cover like what happened to the elms of the past.